Race office open Sunday from 12 until 7 pm. Other days from Mon to Fri 9 am until 7 pm. Additional opening hours Wed morningn 8-8.30 am and Fri morning 6.30-7 am. Program of day offs, at Lapland hotel Olos, check out from here! 8.4.2019 Keimiön Kiekerö 60 km Olos, on the ice of Madelampi Lake 10.30 am. 8.4.2019 Half Keimiö 30 km Olos, below the downhill slopes 12.00 pm. 10.4.2019 Himmelriikin Hiihto 50 km Raattama, Vuontisjärvi Lake 10.30 am. 10.4.2019 Half Himmelriikki 25 km Pallas 12.30 am. 12.4.2019 Karra Huikonen 80 km Hetta, on the ice of the Ounasjärvi Lake 9.00 am. 12.4.2019 Half Huikonen 40 km Muonio, Kerässieppi 12.30 am. 10.4.2019 Himmelriikin Hiihto 50 km Olos-Vuontispirtti 8.30 am. 10.4.2019 Half Himmelriikki 25 km Olos-Lapland Hotel Pallas 11.30 am. 12.4.2019 Karra Huikonen 80 km Olos-Lapland Hotel Hetta 7.00 am. 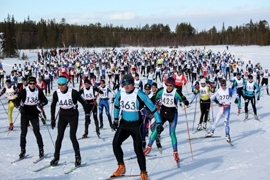 12.4.2019 Half Huikonen 40 km Olos-Kerässieppi 11.30 am. responsibility during the entire race week. The event organizers assume no liability for any personal belongings and equipment of the participants. Soup meal available in Olos log restaurant and included in participation fee. The race office is open daily in Olos Polar Center, Kota restaurant. Time measurement chips and number bibs are available for pick-up during the evenings before the races. Participation numbers and time chips available previous evening before the race from 5 pm until 7 pm. Also possibility to pick up numbers and time chips on the morning of the race 30 minutes before buss transfer leaves at Olos (and during race office hours) as well as from starting place once buss transfer has arrived there. Ski waxing room is available daily for Lapponia skiers in the Lapland Hotel Olos for independent ski waxing in hall located the middle hotel building. Get the pro waxed skis for you by REX. Team of Sportmaniacs sport store will make your skis suitable for the conditions to maximaze your performance. Sportmaniacs REX ski waxing team consists of Sami Laukkanen, Vesa Luukkainen and Lassi Ikonen. Together they have, despite of their young ages, more than 100 years experience of crosscountry skiing as competitors, trainers, coaching and participants. Sportmaniacs is sport store located at Rovaniemi and their speciality is customer service orientated sport store which is specialized in cycling and cross country skiing. Vesa has been part of Peltonen ski waxing team and worked "on the fields" for years waxing skis. Lassi is walking encyclopedia of cycling - he has excellent knowledge and skills concerning different areas of cycling. Sami fullfills their team with his passion to move - personal trainer and customer service skills are definitely his strenghts. This joyful and humorous team has experienced lots of events and sure has some great stories to share. Come and chat with them and be sure to check out their sport store next to ski waxing service point in the ski waxin hall (hall number 5). Warm welcome to visit us! and Sport store open on Friday between 10 am- 6 pm. Handing out of waxed skis also in the morning before the bus transfers leave from Olos to starting places. Payment by cash or usual credit cards. If you are unsure either to take waxing of basic or athlete: ski waxing for athletes makes your skis even more sliding and wear-resistant. If you are aiming to maximize of getting fast time, athlete ski waxing is most likely more suitable option for your skis. Athlete waxing consist of powder waxing and shaping of wax. Shaping of wax is used to minimize the friction between snow and ski in order to increase the sliding. Next to ski waxing services sport store which has selection of eg. Löffler skiing clothes, Helly Hansen thermals, REX waxes and ski poles, Rockl gloves, Hoka one one runing shoes. During the whole week possibility to test brand e-fatbikes from Giant and Liv from 2019 brand new collection! Also skin skis from Peltonen available for everyone to test! Sportmaniacs is authorised Shimano service center, official Giant and Liv sales- and servicepoint, authorised Rock shock service center and Dvo shock absorber and wheel bow service center. If you have your bike with you and you are traveling through Rovaniemi, bring you cycle to our main store in Rovaniemi and we´ll make check your wheel in order for your bicycle season (rock shock). Delivery back to you either to Olos or if you wish to pick it up from Rovaniemi, that is also ok. Price for rock shock wheel service 100 eur + packings. Friday 12.4.2019 in Olos Polar Center auditorium at 7 pm. Come and join us, lottery of products between all the skiers who are present at the price giving ceremony!